The topic of fellowship has become a theme of mine in the last few months. I'll probably do a teaching series on this subject because I feel that many Christians need a release in this area. For many of us, fellowship was the chain that bound us to an institution for a lifetime. To break that chain was to "break fellowship" itself. Because of people's good hearts, they remain tethered to a corpse and slowly become sick, even unto death. This was actually a form of torture in the Bible times. They would chain someone to a dead person. Everywhere they went, they had to drag that corpse with them. Eventually, the toxins from the dead body would make the living person very ill. I can only imagine how horrible that must have been. It would seem that the way to solve being chained to a dead person would be simple. Just break the chain, and you're free. If the chain becomes sacred, however, the person will continue to live with death for a limitless amount of time. Fellowship, by today's Christian standards, IS that "sacred chain" that shackles people till death. I believe that fellowship is the "Jackalope" of Christian society. A Jackalope is a mythological animal that people claim is real. It's just crazy-looking enough to be fake and at the same time, it's not so crazy that it couldn't exist. It's a cross between an antelope and a jack rabbit. In many parts of the country, people seriously believe in Jackalopes. Some folks claim to have seen them with their own eyes. They are the Big Foot of the southwest. From the earliest days of our Christian walk, we are told how important fellowship is. WHAT it is, is an entirely different subject. I believe it' s nearly impossible to know exactly what fellowship is, when you live inside organized Christianity. I can recall few times when I was in the Church world where I was able to put my finger on a solid definition of fellowship. Some days we would go to church and sit quietly while the preacher talked for an hour and then we would go home. They called THAT fellowship. Other days we would do a small group Bible study and everyone would get a chance to talk. That was called fellowship too. If I skipped church one Sunday and went to dinner with a few friends; that wasn't fellowship. It became more and more confusing, the longer I stayed in that world. It would seem that fellowship could be simply defined as two people talking over a cup of coffee, but according to most Pastors, that's not good enough. My question has always been: When is fellowship actually happening? What does it look like? Has anyone really ever seen it? Is there a point in time that anyone can really say; "here it is" or "there it is?" 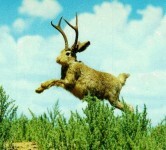 This is why I call it a Jackalope. It's become a mythological character that we hear about more than we actually see. When I left the Institutional setting, I was seriously confused about fellowship. I wasn't sure what it was. I wasn't sure why I supposedly needed it so much. I wasn't even sure if I had it and didn't know it. I also didn't know how much was enough. No one ever told me exactly how much fellowship I needed. There was this unwritten call for us to get more and more, but we were never given any indication as to how much was sufficient. Like Bible reading, no matter how much you do it, there's that dark cloud over your head telling you that you could have and should have read more. I began looking through my life and asking myself if I had fellowship anywhere. As I look back on that experience, I am amazed at how willing I was to excuse things as not being fellowship, when today, I see them as being the very essence of it. I have found that being a Free Believer has increased opportunity for fellowship rather than decreased it. Things I would never have given the title; "fellowship," have now taken a front row seat in my life. Other things that I was trained to believe were the heart of fellowship have mysteriously fallen by the wayside. I used to think that three Christians meeting for coffee at Starbucks wasn't fellowship unless our topic of conversation was Jesus. This led me to believe that I had to steer all conversations to the Jesus subject in order to have fellowship. Today, however, I don't think that way at all. Whether Jesus is talked about or not isn't the issue. It's about the essence of Jesus (love) being lived out and shared with others. His name may not even be mentioned once, but His heart rules the group. There was a time that I wouldn't have considered internet relationships to be authentic. I would have laughed at them and discounted them completely. As far as I was concerned, you had to be face to face with someone in order to connect. Today, I don't believe a word of that. I have found that internet relationships are many times stronger than face-to-face relationships. Some of my closest friends are people I've met in forums and chat rooms but have never laid eyes on. Giving myself permission to call these relationships "fellowship," has been one of the most important decisions I've made in the last three years. I think we've been trained to disregard all forms of fellowship that fall short of sitting in church with our hands folded, listening to a preacher. Reclaiming those connections and calling them fellowship are absolutely essential to a person living in the wild. I've found that most of us would be surprised at how much fellowship we actually do have. Believe it or not, we don't always need an open Bible with people sitting in a circle, in order to achieve fellowship. Amazingly, I've found that listening to a radio show or television show where the opinions resonate with what lives in my heart, is also a powerful form of fellowship that I would have dismissed only five years ago. Just being understood is so liberating and fulfilling that it causes a connection that is needed to spring up in my heart. I've discovered that even reading a book where the author articulates the feelings and emotions whirling in my heart can be fellowship as well. I may never meet that author personally, but he touched me as deeply as a lifelong friend could. Without meeting me, he knows my heart, and just being known is the very essence of fellowship. I think many Free Believers are lonely because they aren't recognizing the fellowship they have. They don't see it as fellowship. They've refused to give themselves permission to call it that, so according to their institutional definition of fellowship; they are without. I believe that if we would just make the adjustment in our thinking and allow the title of fellowship to stand over things that cause our hearts to open in agreement, we would find that we aren't as starving for fellowship as we claim. Washing our minds of the mentality that fellowship must be in the form of church or a Bible study is the first and most important step for a Free Believer. Institutional Christianity has actually stunted fellowship. It has limited it and made it nearly impossible to obtain. What is worse, is that many institutional settings have dished out the exact opposite of fellowship and then taught it's people this it WAS fellowship they were eating. Once that lie gets locked in peoples minds, they go throughout life calling something that's not fellowship, fellowship. It's time to redefine the word "fellowship" and give credit where credit is due. Stop saying you don't have it, because chances are, you do, and you're not acknowledging it as fellowship. Many of Today's Churches hinder true fellowship because everyone has to put on this idea that everything is going great. We are taught not to say anything negative because that would bring a curse upon us. To me, true fellowship can only be achieved in an atmosphere where a person can be real. Much true fellowship comes from the sharing of common suffering. Day-um. You just kicked me square in the face...(in a good way, that is). Since my departure from the IC I've listened to a couple of podcasts on a weekly basis. I've never considered them as fellowship. You're right. They TOTALLY ARE! In a weird way, I feel lighter now. Thanks!! I wonder if looking for 'fellowship' (at least for me) was about feeling validated, believing there was safety in numbers. We are conditioned to trust an organization, but not to trust ourselves, throughout our society. So we feel more comfortable being part of a group that seems to have a plan, even if we are not on board with it. If I don't have a better plan maybe I should stick with theirs, right? Going to church made me feel like a good person. That's the way it works. You follow the rules, you get the brownie points. It's ridiculous. But I miss feeling part of that sometimes. It might boil down to this: Church going is a quick way to feel LESS like a degenerate. And being with other church people intensifies that feeling. Knowing God loves me trumps all that, though. I really liked what Darin wrote here, in that it is providing a way to move forward, a way to grasp the goodness of life and to explore freedom through good choices. One definition of felllowship is "The companionship of individuals in a congenial atmosphere and on equal terms." What great words. For me I have stopped using the term and prefer to use friendship instead. Understood by everyone and without any inherited baggage. I have believed this for years and years. honestly when people told me the contrary I dismissed them as "immature" in the Lord. it's a polite way of calling someone stupid. Think of the word fellowship itself. the definition itself means simply a group of individuals (number undefined) getting together in friendship. I never thought to include sitting in a service, reading a book or listening to the radio. I love what your doing though. Keep up the good work and I love you. I feel like the IC trains people to relate out of this "false self" so much that real fellowship can't really even happen. Having been to one such gathering recently, I find it frustrating that people can't even carry on a normal conversation. They lose all interests in their life and can hardly relate out of the context of a very scripted meeting (Bible Study) or anything that isn't motivated out of the IC agenda. I think it's this agenda that defines "fellowship" for IC beleivers, but it's this agenda that kills real fellowship. It's like trying to catch up with an old friend who you quickly find out has just signed up with Amway. It sort of kills any realness when you feel like you are always either viewed as a client or a potential client. Darin, I agree with your awareness that IC has misconstrued the definition of fellowship. I have tried to kindly and gently explain to my objectors that fellowship should not be so narrowly defined. I agree with you in your commentary entirely, however, as a woman, I need a little bit more. I do need others at my side, physically to banter, discuss, laugh organically, freely and instantly. Not all women may feel this way but I am sure there must be more than just me who does. Just bringing up an extra point you may not have considered seeing as you are not a woman. That being said, I must confess that even though I am alone on my journey and feel isolated most of the time, that rarely do I feel lonely. He has promised that he would be enough and honestly, he is. I think that's a great point Lori.......The other thing I don't think I mentioned in this article is the value of fellowship with people who may not even be believers. Those connections are every bit as important as any others because they do fulfill a space in our hearts that need to be touched. I think we hold back from those relationships because we've been taught they are either not safe or not authentic. Good one Darin & your comments to Lori, also. The FBN is a great source of relationship for me- even when I'm sitting alone listening or reading. Sometimes I laugh out loud or (believe it or not) add my own two cents:) I've turned up the podcasts so loud ( say when I'm doing the dishes) that a neighbor popping over to visit thought I was going deaf. She'd probly think I was a tad crazy as well if she heard me commenting on something I was listening to. This is what church or fellowship is really about. I love all of it. Thanks Debsfree - I sometimes think people feel like they've been living on the planet of the apes their entire life and they've just seen their first human. Knowing you're not crazy and other people speak your language is extremely liberating. Well, this is refreshing and liberating. I have longed for more fellowship all my Christian walk and found it to be a burden that kept me focused on myself, others away and made me feel constantly needy. A bit like lust with that 'never enough' feeling. Am very glad to have read this and found this site. I can trust that God is providing enough fellowship in my life and embrace what He is doing, with a smile. As someone who 'never fits in' in church circles, this article strikes a chord with me. I haven't attended the IC for approx one year now (although, in my heart, many years ago) and I am told that I must not forsake having 'fellowship' or the gathering together of believers i.e going to church every Sunday. When I do go, or mix with folk who still are 'inside', I find conversations to be extremely shallow. Being a free-thinker/believer is too radical for them, I think. I have found that although we are supposed to have something in common, (Jesus), there is nothing of any substance in any conversation, and I can no longer be bothered playing the charade. It is a blessing to have fellowship via the internet - podcasts, articles, and skyping other free believers! Man...this is good. I agree totally, even the word "fellowship" should be taken behind the barn and shot. Fellowship in IC is extremely unnatural and forced and IMO is one of the reasons Men (males) hate church. The unfortunate reality is that in most IC's "fellowship" with people from other churches or other brothers and sisters who are not in church is discouraged. "Fellowship" is often just another tool in the church growth tool box. Often people are not gathering around the person Christ, they are gathering around the vision of the pastor. I agree that the word "fellowship" has been misused, but my heart still cries out for more opportunities to gather with groups small or large and share our lives together, bless each other with our love, our spirit-given gifts and our varied ways of expressing who Jesus is. God didn't create an institution, but he did create a community, a fellowship of believers, a body, a bride, a church...and he takes great joy in sharing "fellowship" with his creations, and in their "fellowship" with him and each other. These forms of fellowship happen naturally Arlene. When a person has love in their heart, they are driven to such connections with others. It becomes cold and dead when an institution attempts to capture and govern it. Your comments bring me to tears...tears of relief. So, there are many others 'out there' who have been told that since we are not in the 'Church' we are not fulfulling the Law. Yet, as a young believer in Mayasia recently put it, "the royal law of love" is fulfilled by loving the L'rd our G'd, and our neighbor as ourself. And, with our King's instrucion on just who our neighbor is, we must be 'fellowshipping' all over the place! Sometimes, I long for a group to attend, to belong to, as I did for so many years. Sometimes, like some of you, I feel so alone and isolated. Yet, with my Hebrew studies, a friend or two, "neighbors", and online contacts I'm not so alone, after all...yes, Darin. I can't help but wonder, what G'd, bless His name, is up to with us. Paula, I think many of us Christians were taught to fear a lack of "fellowship" for the purpose of keeping us in Church. Some of us feel like we are dying when we get out into the wild because we were taught to feel that way. We act like my two-year-old son who screams the moment we set him in the 1 foot deep baby pool. We think we're drowning, but we're really not. Remember - Adam and Eve had only each other and God. I can SO RELATE to this! We walked away from the church a year ago after a very negative experienced that caused us to question many things; we are the only ones among our friends who have done walked away. We have heard that we "ought to be in fellowship" but I asked, "Who says what we experience in church is fellowship???" Why is it not ministry or fellowship if it's not through the church? I feel more in fellowship with friends one-on-one, via phone, or through the Internet than I ever have sitting in church. What's lonely/difficult is trying to overcome lifelong teaching and the criciticms of friends that fellowship/ministry happens only in the church--and we are outside it. I am out of step with other Christians and start to secondguess myself. Teri, I hope you will let yourself rest and 'fellowhship' with G'd and whoever else you come into contact with during your day. It's hard indeed to feel out of step but it's worth the weird:) There's no faking it now, for me. No going along with programs even when my spirit was crying. Not that we were trying to fake anything...just that it winds up feeling that way in retrospect. I no longer have the 'latest' teaching to wrangle with or the 'latest' word from G'd...I have His Word, and His Spirit, who teaches me. I have a few good friends (church goers) who keep loving me and fellowshipping with me. We toss thoughts back and forth and learn by loving each other. I study and cook, and sew, and grow veggies, care for beasties, and give charity. May the L'rd be magnified. I have had more meaningful "conversations" on this blog in a week or two than I have had in years in church. Not to say there are not some genuine loving people with whom there are real connections, but you probably know what I mean.